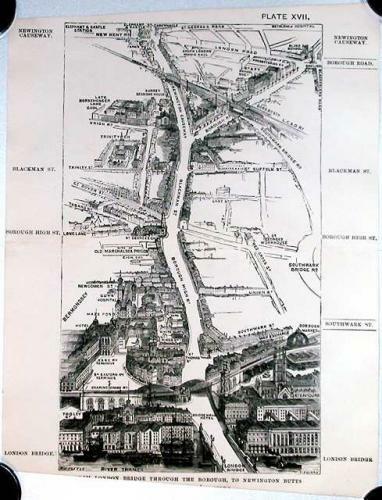 Title: London in 1887, Plate XVII, From London Bridge through the Borough to Newington Butts. Publication: London in 1887. Author: Fry. Herbert, Engraver: Sulman. T, / Ruffle. G W.
A panoramic bird's eye view part of the Borough of Southwark from London Bridge to the Elephant & Castle. The buildings have been engraved in extraordinary detail. Scarce. Folds as given. Professionally cleaned and de-acidified. Unfortunately badly trimmed to top and bottom with loss to the title beneath the engraving.